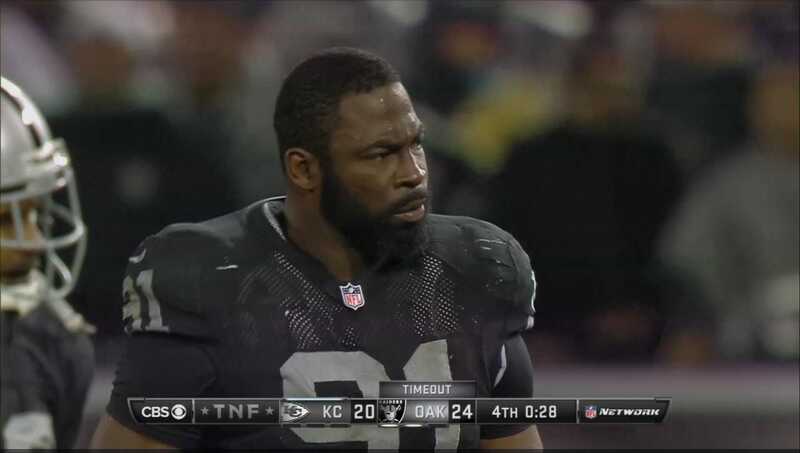 The Oakland Raiders won their first game of the season on Thursday night, beating the Kansas City Chiefs 24-20 and ending a 16-game losing streak that dated back to the middle of last season. But the win did not come without some anxious moments and a team that is not used to winning nearly blew the game in the worst way possible. 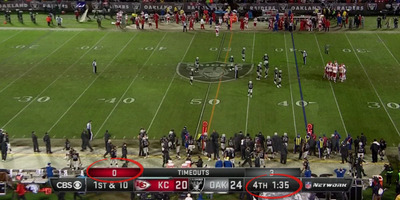 After taking a 4-point lead with less than two minutes to go, the Chiefs needed to go 61 yards in 95 seconds to score a touchdown and they had to do it without any timeouts. 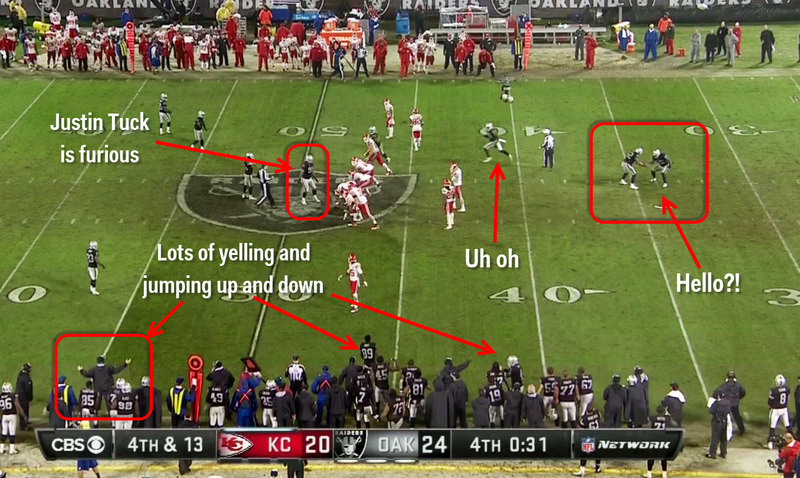 After converting one first down (thanks to three Raiders penalties on the same 4th down play) the Chiefs were facing a third down at the Raiders’ 45-yard line with 49 seconds left. 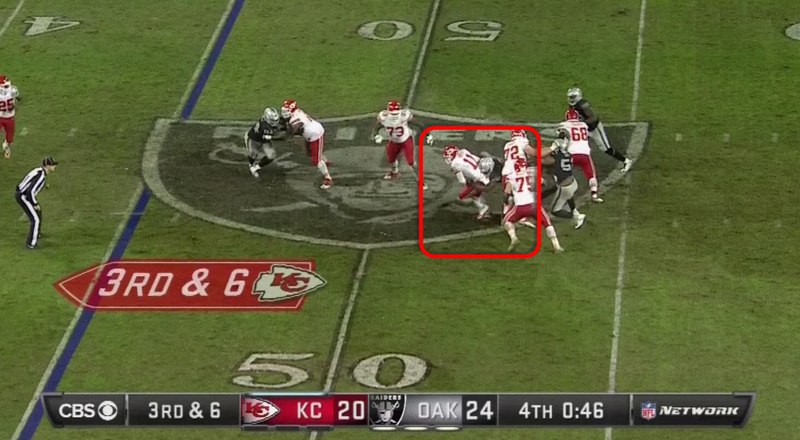 On the third down play, the Raiders got a huge sack of Chiefs quarterback Alex Smith, dropping him for a 7-yard loss. 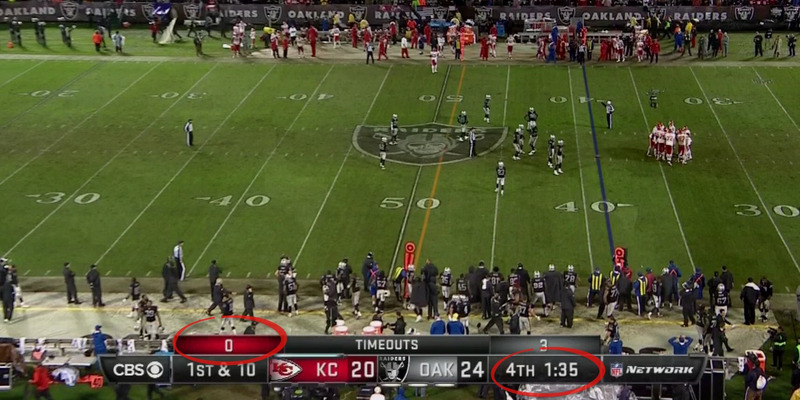 The Raiders are in great position now as the Chiefs are now facing a long 4th down, have no timeouts, and the clock is running. Two of the players even took time to do a special handshake while their teammates are screaming at them and the Chiefs are about to run a play. The Chiefs are about to get a gift of a 5-yard penalty which would turn a nearly impossible 4th-and-13 into a much more manageable 4th-and-8. On top of that, the penalty will stop the clock. The Chiefs eventually snapped the ball and flags were thrown for offsides. But luckily for the Raiders, they had one veteran player on defence who knew what was going on. Tuck was not happy. 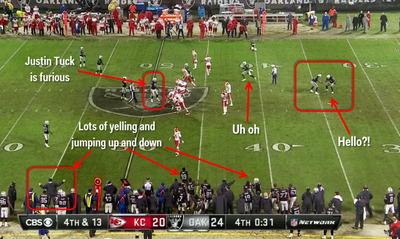 But despite giving the Chiefs a free timeout with 28 seconds left, his head’s up play kept the 4th down play at a longer distance, the Chiefs failed to convert, and the Raiders held on to win.